USAID is one of the major donors supporting property rights development in Timor-Leste. Property rights in Timor-Leste remain ill-defined as a result of a combination of conflicting property regimes (as a Portuguese colony and, later, Indonesian occupation), complex customary land tenure systems, the destruction of land records in 1999, limited government capacity, and generally weak government and civil society institutions. This state of uncertainty persists under independence as the newly independent state attempts to establish a land administration system. A Technical Framework for a Transitional Land Law for East Timor was developed in 2008 with the assistance of USAID. Based on this document the Minister of Justice established a Land Law Working Group which prepared policy options for the development of a land law. A land bill was developed and submitted to Parliament in March 2010. It is currently being reviewed by a Parliamentary Committee, although a clear timeframe for its movement forward has not been set. A claims collection process has begun through Ministerial Regulation on the Cadastre No. 229/2008 which will allow property claims to be collected, adjudicated, and resolved throughout the country if the land bill is ever enacted. However, the Gusmão Administration has now introduced a decree (decreto-lei) that proposes providing a quasi-title to unchallenged claimants. It is recommended that efforts be continued in the areas of dispute management and resolution, institutional support (through the office of Land, Property, and Cadastral Services (DNTPSC)), consolidation of the land claims process (including support to the determination of disputed claims to ownership under an eventual land act), a system of communal land rights administration, and the establishment of a system of land use management under the umbrella of a comprehensive land policy. The Government of Timor-Leste (GOTL) is currently addressing property rights through the development of land law and policy with support from the USAID’s Strengthening Property Rights in Timor-Leste (SPRTL) project. The Ministry of Justice has rejected an omnibus land legislation approach and in 2008 issued Ministerial Regulation on Cadastre No. 229/2008, which outlines the systems and procedures for collecting land claims. Parliament is now considering a land bill that would establish first title for property in Timor-Leste. At the same time, the Minister of Justice is, with support from the Gusmão Administration, developed an alternative strategy that will permit the issuing of land titles through a decree (decreto-lei) (that will not require Parliamentary approval). Subsequent transactions will be governed by the proposed Civil Code. The Civil Code is based on the Portuguese Civil Code and is currently in Parliament. As Timor-Leste grows and develops, it will be critical to facilitate the voluntary registration of communal lands to avoid conflicts between communities and potential investors (Nixon 2009). Donors could support this registration process, ensuring that communal land rights of customary communities are acknowledged. Emerging areas for policy and legal support may include: cadastral commission, community land, land use management (urban and rural), State expropriation, land valuation, and evictions from State land. Some of these issues will require the passage of the land bill and others will require development of new policy and legislation. Donors could support the development of new policies and legislation. DNTPSC is in need of management training and assistance with work plan and budget development. Support could also be provided with communications, procurement, and inter-institutional coordination. Donors could complete an assessment of DNTPSC needs and provide assistance to strengthen the institution. Technical support to the land administration in Timor-Leste could be provided in the form of the expansion of the land claims process (especially as it relates to community land), building capacity in processing land transactions, supporting technical training programs, resurveying, and providing mediation training and support. Donors could work with land administration institutions to assess priorities and provide support to address these needs. In 2008, Timor-Leste (formerly known as East Timor”) was ranked as one of the poorest nations in the world (158 of 179 in the 2008 Human Development Report) and the poorest in Southeast Asia. The population of Timor-Leste is primarily rural and engaged in agriculturally based livelihoods. More than 50 percent of the land area is forested, but deforestation rates are one of the highest in Southeast Asia and the Pacific. There are potential mineral resources including hydrocarbons. Hydrocarbon exploitation at sea is the primary source of income for Timor-Leste (through the Petroleum Fund – a sovereign wealth fund established by law), but exploration of other resources has been limited to date. Formal and customary land rights are in a state of transition resulting from years of colonization, occupation, and unrest. The periods when Timor-Leste was the Portuguese colony, Timor, and the subsequent absorption into Indonesia were marked by the application of differing and often conflicting property regimes as well as appropriation and redistribution of land and displacement of people. This situation was further exacerbated by the removal and/or destruction of most public records, and the destruction of buildings, during the violent withdrawal of Indonesian forces in 1999. A period of relative calm prevailed under the United Nations Transitional Administration in East Timor‖ (UNTAET), which exercised legislative and executive authority during the period between August 1999 and May 2002, the year when Timor-Leste became an independent state. However, additional violence and civil unrest in 2006 resulted in additional displacements and occupations of land and urban properties. The Timorese land bureau — the Direcção Nacional de Terras, Propriedade e Serviços Cadastrais or DNTPSC — was established in 2003 and is responsible for land administration. USAID has been working with DNTPSC and the Ministry of Justice since 2003 to develop a comprehensive land law and policy through the SPRTL project. Through the support of this project, significant strides have been made in the development of property rights in Timor-Leste, including the establishment of a claims collection process that will serve as the basis for property rights once a land policy and legal framework are put in place. SPRTL supported the drafting of a Technical Framework for a Transitional Land Law for East Timor, which was submitted to the Timorese cabinet (conselho de ministros) in 2008. This framework served as the basis for the development of legislation and implementing regulations to establish first title. The Land Bill was introduced to Parliament in March 2010 but a clear timetable for its passage has not been established. Additionally, the Minister of Justice has developed, and the Cabinet has approved, an alternative strategy that will permit the issuing of land titles under a decree since the Land Bill has failed to be passed in a timely fashion. Future land and property transactions will be governed by the Timor-Leste Civil Code (which is also undergoing Parliamentary review) and a proposed Land Rights Registration Decree Law, which is in the final stages of development. The total land area of Timor-Leste is 14,870 square kilometers. Forests cover approximately 54 percent of the land area but deforestation rates are some of the highest in the region with total forest cover decreasing by 1.3 percent annually between 2000 and 2005. Estimates of the total arable land range from of 8.2 percent to 13 percent. Land in permanent cropland is 4.6 percent of the country’s area and only 1,065 square kilometers of this is irrigated (FAO/WFP 2007; CIA 2010). 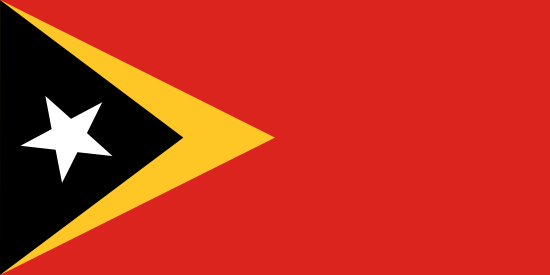 The total population of Timor-Leste is 1,066,582 (2010 Census). Most of the population (73 percent) inhabits rural areas. The national poverty incidence is 40 percent but this is disproportionally concentrated in the rural areas where 86 percent of the poor live (CIA 2010; World Bank 2009). Eighty percent of the country’s population is dependent on agriculture, forestry, and fisheries for their livelihoods with 90 percent of the labor force engaged in agriculture. One-third of households are engaged in subsistence farming and shifting cultivation is widely practiced. The majority of farmers own less than one hectare of land. The main agriculture products are food crops such as rice, maize, sweet potato, and cassava. Other crops, produced on a tiny scale, include yam, soybean, taro (swamp and upland), squash, pumpkin, cabbage, onion, peanuts, sago, coconuts, fruits, coffee, and tobacco (Aube et al. 2007; World Bank 2009). 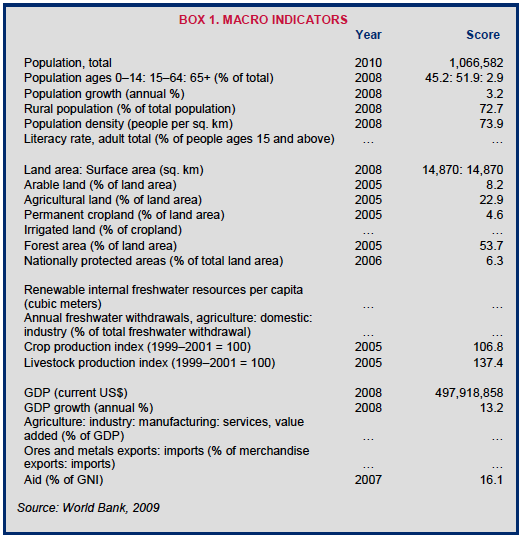 In 2008, the country’s non-oil Gross Domestic Product (GDP) was US $350 million portioned as follows: 32.2 percent agriculture, 12.8 percent industry, and 55 percent services (Aube et al. 2007; CIA 2010). Generally, inequitable distribution of land or extensive landlessness is not a problem of major concern, with two possible exceptions. First, most of the internally displaced peoples (IDPs) have returned, but some of the IDPs located in West Timor are returning gradually to Timor-Leste. Most of those IDPs have no formal claim to property that they fled. Because customary rights are based on occupation and use, these people may have limited access to land in the future (Carson 2007). Second, there is a small group of families that claims rights to extensive land holdings through titles issued by the Portuguese (especially around Dili). However, many land title records were destroyed in the violence and unrest of the past decades and many lands subsequently occupied by others either with permission (i.e. through Indonesian authorities) or otherwise. Should Portuguese title to these lands be recognized, a few families could hold extensive tracts of valuable land in Timor-Leste (Carson 2007). The Constitution establishes that both men and women have the same rights and duties in every area of family, cultural, social, economic, and political life but limits land ownership to national citizenship (although there is a question as to whether this extends to legal entities such as corporations). For national citizens, private property rights include transfer rights, and the right to just compensation if expropriated by government for public purposes (GOTL Constitution 2002, Arts. 17, 54). Customary rights are recognized in the Constitution so long as they do not contradict the Constitution and legislation that regulates them. Law 01/2003: Juridical Regime for Immovable Property: Part 1 is the umbrella land law and it establishes the legal jurisdiction for addressing land issues; defines land law-related legal terms; defines State property; establishes the DNTPSC and its substantive powers (which have been further articulated in subsequent organic laws); and allows for future legislation to enhance the juridical regime of immovable property. One of the substantive powers allocated to the DNTPSC is the status to settle disputes between parties via non-judicial mediation. However, it does not provide a legal basis for customary land to be declared as public state land. This would be inconsistent with the takings clause of the Constitution. Law 12/2005 on Leasing Between Private Individuals establishes minimum conditions for lease agreements of private property between individuals while Decree Law 19/2004 on State Property Administration/Leasing of State Property provides that State property cannot be handed over for exclusive use of individuals, except through lease concession or temporary exploitation provided by law. Law 12/2005 also establishes temporary housing for homeless citizens, processes to ensure access by national or overseas investors to property, and the normalization of State property to be used in commerce and industry. Finally, Law no. 12/2005 establishes the regime for leases between individuals (GOTL Constitution 2002, Arts. 138, 54). United Nations Transitional Administration in East Timor (UNTAET) Regulation 2000/27 bans the sale of land and granting of leasehold interests by Indonesian citizens and corporations. UNTAET Regulations are in force until they are replaced by applicable Timor-Leste law. In reality, however, there is a significant land market especially in urban areas and areas of high value irrespective of the law. The Ministerial Regulation on the Cadastre No. 229/2008 serves as the basis for land claims data collection and is an important step toward developing a comprehensive land law and policy. The draft land law establishes the criteria to determine ownership rights based on peaceful possession and on previous titles and will govern the processes for first registration of title. Failing this, an alternative approach being pursued by the Minister of Justice is the promulgation of a Decree that would grant quasi-titles to unchallenged claimants to land. Subsequent title and related property rights will be governed through the proposed Civil Code that is currently before Parliament. The incomplete land legislation in Timor-Leste gives rise to three major issues that will have to be resolved through the passage of the land law. First, there is currently no mechanism to convert Portuguese and Indonesian titles to a Timorese equivalent. Second, there is no legal mechanism to recognize ownership rights of possessors whose parcels have never been issued a title. Third, there is no mechanism to address resolution of conflicts when Portuguese and Indonesian titles overlap. Timor-Leste’s three main land classifications are State property, private property owned by individuals, and communal land which is possessed by origin groups. Origin groups are generally defined as ethnically related groups of people. According to 2005 survey data, only about 3 percent of rural land in Timor-Leste appears to have been alienated from customary tenure (Nixon 2009). Customary rights are organized around principles of origin and alliance. This is the primary land tenure type in rural Timor-Leste. Origin groups define themselves as the first possessors of certain areas of land and origin group’s authority is generally recognized and accepted by other origin groups. However, membership in an origin group is based on kinship and not on territory. As a result, origin group land may not be contiguous. In addition, boundaries may not to coincide with current administrative boundaries. Within origin groups, rights to land are highly individualized: gardens and plantation plots may have clearly defined boundaries, may be owned by families and individuals, and may be inheritable by direct family members. In addition, ritualized prohibitions to access and use (referred to as tara bandu) are maintained on some areas of land (Fitzpatrick et al. 2008). Communal land is recognized in customary law and is often forestland that is used by an origin group for hunting, gathering, and other purposes. However, it can also be a communal farming area where any member of an origin group may farm. Similarly, some common property has ritualized prohibitions attached to it that are maintained by the associated origin group. There is no formal title system for communal land although the draft land law provides a framework for its establishment. However, communities have no formal right to forestland (Fitzpatrick et al. 2008). The land bill establishes that immovable property currently in the possession of the State will remain as State property despite the lack of a formal registration system (although compensation issues may arise in respect of former ownership by non-State parties). Due to the absence of a recognized land law, there is not yet a formal system to record private ownership by individuals. The Timor-Leste government developed the land bill with the assistance of USAID’s SPRTL project, which has established processes for recording claims. The major issues that a land legislation would address are how to resolve competing titles and how to resolve land claims where, for example, one claimant holds an Indonesian or Portuguese title, while another claims title based on use and possession. It is likely that unchallenged claims for land based on use and possession and where no title is claimed, will be granted to the claimant. This is consistent with the customary land law of Timor-Leste (Fitzpatrick et al. 2008). In most of the rural areas of the country, people acquire rights to land through customary practices. Origin groups have the authority to allocate customary communal land to individuals within their origin group. There is a general sense within origin groups that land cannot be sold to outsiders. However, non-origin group individuals might also gain usufruct rights through allocation of land by the origin group. These rights are limited to use and possession only and are not considered inheritable. These rights are generally allocated to relocated groups or displaced people (ibid). Secondary occupants living on and using property to which they have no formal title often claim ownership based on long-term possession. However, this title cannot be formalized until legislation is passed (ibid). In rural areas, long-term peaceful possessors/users of land are regarded as having a higher claim than others possessing a formal title to that same land. However, that may change depending on the legislated process that is developed and implemented to resolve disputes related to these types of title. Only Timor-Leste citizens may own land and there is a question mark as to whether this extends to legal persons (corporations and other legal entities). However, Decree Law 19/2004 on State Property Administration/Leasing of State Property provides for lease concessions and special leases so that national or overseas entities have access to land, and so that State land can be used for commerce and industrial development (JSMP 2005). While the State is responsible for administering leases of State land to foreign and other persons and entities, there are no reliable records regarding the amount of land leased and/or occupied by foreign entities, and the general state of the land administration records is poor. On properties where conflicting titles or claims based on use have arisen, the lack of formal legislation presents tenure insecurity issues. These cases will need to be resolved legislatively. However, the vast majority of property is held customarily and at present there is little indication that most customary rights will face challenge. Of the estimated 200,000 land parcels in Timor-Leste, less than 25 percent have ever been formally registered. Of the remaining untitled parcels, the vast majority are held by traditional landowners. The majority of registered parcels were registered during the Indonesian occupation in urban, or peri-urban, areas. However, deeds registered during the Indonesian occupation and Portuguese colonial periods were largely destroyed or records removed during the violence in 1999. As a result, there are very few recorded deeds available. This in part explains why use and occupancy rights are more secure than formal ownership (Carson 2007). The State may allocate land through lease under Decree Law 19/2004 on State Property Administration/Leasing of State Property. Law 19/2004 provides that State property can be leased to individuals to facilitate temporary housing for the homeless for one year with extensions. The process for individuals to secure residential lease rights where they have occupied the developed property since 2000 is as follows: following the submission of an application to the DNTPSC, the property is marked on orthophoto maps and a special lease is prepared and identified by the photo attached to the lease; the lease and photo are then entered into a database. However, the process for leasing lands to business entities is less clear and complicated by a lack of protocols to establish land leases (Nixon 2009). Timor-Leste is home to both patrilineal and matrilineal customary land-tenure systems, but in practice under both systems, women generally have limited and conditional access to land rights. Local inheritance systems are primarily patrilineal, but matrilineal systems do exist in Bobonaro, Cova Lima, Manatutu, Manufahi, Oecusse, and perhaps other districts. That said, land inheritance and use are subject to various exceptions and negotiations under both systems (Pyone et al. 2007). The claims collection process established in Ministerial Regulation on the Cadastre No. 229/2008 indiscriminately recognizes the claims of women. The claims collection process is being supported by USAID programming and in its implementation is providing women and other marginalized groups with access to property rights claims. The draft Civil Code includes provisions protecting women’s inheritance rights (Dale et al. 2010). The DNTPSC was established in Law 01/2003, along with its jurisdiction. DNTPSC is responsible for administering immovable property, i.e. 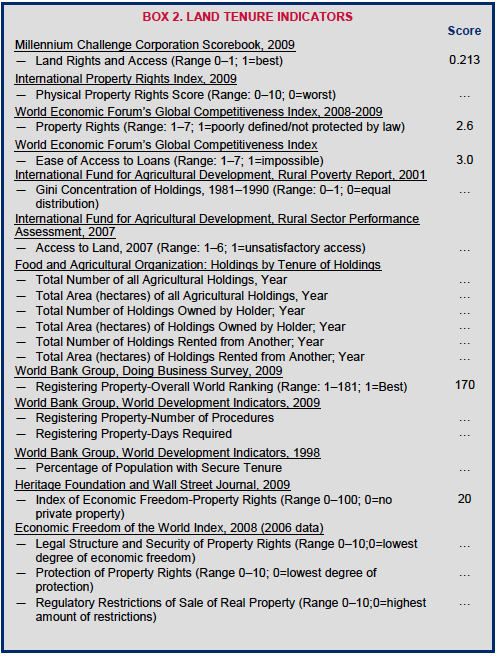 land, in Timor-Leste, including registration and publishing of land titles. Currently the processes for registration and titling are not in place and functioning throughout the country. DNTPSC is also charged to develop national land policy and draft legislation. Currently, it is ineffective in carrying out this task and the institution’s ability to plan, develop, and implement policy is extremely weak. In cases where a land claim is disputed by an occupier and by a formal deed holder, the deed-holder may claim rights to the land with village chiefs by presenting documents in proof or eyewitness support. The village chief may mediate (in practice, more likely arbitrate) between the claimants, although there are no legal regulations related to this activity. If the issue cannot be resolved by the chief, claimants may go to the DNTPSC, or further to the courts. Courts have decided cases of property disputes based upon statements from village chiefs, Indonesian law, and the UNTAET regulations. However, even where there has been resolution, certificates of ownership cannot be issued because there still remains no legal basis for the recognition of property rights in these cases. However, these claims may be registered under the Ministerial Regulation on the Cadastre No. 229/2008 for future resolution once appropriate legislation is in place. In places where customary rights are limited, the chefe de suco (head of township) may play a major role by witnessing documents and otherwise lending credibility to land transactions. This situation also can resolve a claim to a property, but does not convey legal title, which will need to be determined through future legislation. Such witnessing, however, has often been confused by corruption and self-interest so the integrity of this process is sometimes in question. In rural areas, there are land scarcity issues, and limited land markets. Access to land is usually limited in these areas to affiliation with an origin group because customarily, land may not be sold to outsiders. Some outside private interests have attempted to lease or otherwise support the use of land for example, through share cropping, with very limited success. Currently, State lands cannot be sold; the legal framework is only in place to lease State land to individuals and organizations through Decree Law 19/2004 on State Property Administration/Leasing of State Property. Leases between individuals are registered with the DNTPSC and provide security of use. Requisitioning and expropriation of property for public purposes shall only take place following fair compensation in accordance with the law. Further, under the Constitution, illegal appropriation of real estate and property prior to the taking effect of the Constitution is criminalized (GOTL Constitution 2002, Arts. 54, 161). The vast majority of people occupy properties in Timor-Leste where they have no formal title. However, their ownership of these properties is largely undisputed. The most common sources of land disputes include: intra-family/inheritance disputes, appropriation of customary land by successive governments, disputes between title holders and those claiming rights through possession and use, and, to a lesser extent, conflicting Indonesian and Portuguese titles issued to the same parcel. Where customary land is not widely accepted as authoritative (i.e. urban and peri-urban areas), the lack of a legal mechanism to resolve title disputes between competing titles or between title holders and occupiers remains an obstacle to resolving land disputes (Carson 2007). Generally, customary authority is recognized throughout the rural areas of Timor-Leste. Custom is less influential in sites of Agricultural Settlement Programs instituted by the Portuguese and continued under the Indonesian occupation. These are primarily irrigated rice field areas. Generally, customary rights were less strong in many of these areas because historically these lands were forested and used primarily for hunting. Those who historically would have used the forestland for hunting and other purposes would have contested claims by those who opened the land for agriculture. However, most conflicts in this area originate from claimants seeking to legitimize their claims though unstable alliances with state or political authorities (Yoder 2003). Customary authority is also weak in peri-urban areas where land markets have been developed. In these places, the chefe de suco may play a major role by witnessing documents and otherwise lending credibility to land transactions. However, chefes de suco will likely consult with origin groups where a transaction is to take place on land claimed by origin groups; especially where the transaction involves a foreigner or outsider to the origin group. The reach and influence of the formal justice system remains limited in Timor-Leste. There are just four courts in the country, and while some land cases are heard, the Courts’ backlogs generally limit hearings to the most serious criminal offenses. Given this limitation, it is likely that the non-state and informal systems of conflict resolution will continue to dominate adjudication of land tenure related claims (Dale et al. 2010). Under Law 1/2003, DNTPSC has jurisdiction to settle disputes between parties through non-judicial mediation, a process put in place under UNTAET. Approximately one-third of land disputes are subject to mediation, which is performed by DNTPSC officers and trained community leaders. Mediation is also supported through USAID’s SPRTL Program in the context of collecting land claims. The Ministerial Regulation on the Cadastre No. 229/2008, which serves as the basis for land claims data collection, is being used to collect claims which will be adjudicated according to a process that will be established in future legislation. In addition to being an important first step in developing a comprehensive land law, the claims collection process also serves to reassure the people of Timor-Leste that their claims will be addressed in an open and transparent manner. More broadly, the claims collection process is building necessary popular support for the adoption and implementation of land policy and legislation. USAID, through the SPRTL program, is supporting an extensive public awareness campaign to spread awareness about this process. Courts have also determined claims but the ability of the courts and the DNTPSC to address claims will be greatly enhanced once a formal legal process is put in place. Currently, the efficacy of the judiciary is limited due to the lack of governing law and the lack of documentation, as well as by the limited capacity of the judicial personnel and other weaknesses within the judicial institutions themselves. The GOTL has addressed property rights through the development of land law and policy with support from the SPRTL project and a land decree. The Ministry of Justice has rejected an omnibus land legislation approach and recently issued Ministerial Regulation on the Cadastre No. 229/2008 which outlines the systems and procedures for lands claims. Parliament is now considering a land bill that would establish first title for property in Timor-Leste. There is no clear timeframe for its passage. The Minister of Justice has pursued a parallel path to formalizing undisputed claims through the medium of a Decree on the subject. This Decree seems likely to result in the issuing of land titles in unchallenged claims and not require Parliamentary approval. Subsequent land transactions will be governed by the proposed Civil Code. The Civil Code is based on the Portuguese Civil Code and is currently in Parliament for debate. As Timor-Leste grows and develops, it will be critical to facilitate the voluntary registration of communal lands to avoid conflicts between communities and potential investors (Nixon 2009). USAID is one of the primary donors in the land sector with support totaling US $6.4 million for 2009 and 2010 to implement SPRTL. The objectives of the project are (1) to strengthen land policies, laws and regulations; (2) to assist with survey registration and titling of land; (3) to implement land administration and information systems; (4) to develop land dispute resolution systems; and (5) increase public awareness of land issues in Timor-Leste. The Irish Government provides limited support through the Haburas Foundation to provide support to civil society’s analysis and strategies for resolving land title and tenure issues through the Land Legislation Mentoring Project. UNDP supported a project to include sustainable land management mainstreaming in national policies, plans, and legislation. The project concluded in 2008. The outcomes of the project were a National Action Plan on Sustainable Land Management and increased institutional and knowledge capacity for sustainable land management. The World Bank’s Justice for the Poor Project has, at the request of the Minister of Justice, worked to develop a policy options paper on the Communal Land issue. This policy options paper has benefitted from significant input from USAID. The FAO is also working on land in relation to agriculture and forestry at request of the Minister of Agriculture. In this regard, a consultant from the FAO is reviewing for the Minister of Agriculture the draft Land Law, the World Banks’ Policy Options paper on Community Land and their linkages to the Agriculture portfolio. The main rivers of Timor-Leste are the Loes, the Comoro, the Lacló, the Karama, the Seiçal, the Caraulun and the Sahon. Most rivers are seasonal. There are several freshwater lakes, the largest being Lake Iralalara, in the Nino Konis Santana National Park, which covers 15,000 hectares at its largest and is home to over 50 water bird species. Annual rainfall varies throughout the country from an average of 565 millimeters along the north coast to 2,837 millimeters in the central-western mountains. However, there is limited knowledge and data of the status of inland water ecosystems and wetlands. Land degradation resulting from swidden agriculture, fuel-wood collection, and overgrazing has contributed to increased runoff and reduced water infiltration leading to localized flooding in the rainy season, and reduced overall river basin flows during the prolonged dry season (ADB 2005). Because of the mountainous terrain and abundant rainfall, there is potential for hydropower development in several locations. Micro- and mini-hydropower is likely to have a significant role in the electrification of isolated villages or groups of villages unlikely to be connected to the grid within a 10- or 15-year timeframe. A Norwegian assistance team is working on water in relation to all aspects of Timorese life including hydro-power. A National Water Resources Management Policy has been drafted for Timor-Leste but has not yet been adopted by the government. Large river systems are usually considered open access resources. Restricting access to these watercourses is generally prohibited. That said, forms of customary claim and authority over specific resources such as aquatic foods or seasonally abundant species are common (ADB 2005). There is no clear system by which outsiders can secure water rights claimed by customary users. For example, where use rights to water resources are sought by outsiders for irrigation purposes, the process of securing community agreement, may well be more a matter of strategic improvisation and negotiation than any simple following of traditional rules and ritual requirements (ibid). Natural springs are the primary source of water for potable and agricultural uses for most communities in Timor-Leste (especially in upland areas). Generally speaking, community support for spring capture and pipe distribution systems is dependent, among other things, on the agreement of key customary elders (Tetum: Katuas lia nain, Ind: Ketua adat). The nature of the custodial claim to natural springs is typically one of ritual interdependence founded on forms of ancestrally constituted rights and emplaced authority over the water resource. These claims tend not to be based on assertions of ownership, but rather as forms of protective custodianship and inherited management rights (ibid). The Ministério das Infra-Estruturas (the infrastructure ministry or MI) through its Direcção Nacional dos Serviços de Água e Saneamento (water and sanitation department or DNSAS) supports rural water and sanitation infrastructure policy and implementation. The Ministério da Economia e Desenvolvimento (economy and development ministry or MED) and the Ministério da Agricultura e Pescas (agriculture and fisheries ministry or MAP) play a key role in water resources management. The MED is responsible for environmental planning, urban environmental services, and ecology. The Direcção Nacional da Irrigação e Gestão da Utilização da Água (irrigation and water use office) is one of the MAP offices responsible for the protection, management, and enhancement of watersheds. There is no clear policy or institutional framework for the management of inland water. Further complicating water management is the recent development of uncoordinated programs and policies (GEF/UNDP 2007; ADB 2005). District plans for water supply have been developed identifying priority projects across the region. However, the government has struggled with allocating resources to the district level and as a result many priority activities remain unfunded. USAID’s District Water Supply, Sanitation, and Hygiene Services (DWASH) program is designed to strengthen the ability of the GoTL to deliver district and sub-district level water and sanitation, health, and environmental services. The program works closely with district and sub-district government staff of the DNSAS, Ministério da Saúde (health ministry or MS) MED and MAP as the primary program counterparts. Technical support will be provided to build capacity at the district and sub-district level. The major donors in the water sector include the ADB and the Japan International Cooperation Agency (JICA) who provide the primary support for the development of urban water management systems. JICA also implements an agriculturally focused watershed management program in two river basins (Lacló and Comoro). The leading donor for rural water, sanitation, and hygiene (WASH) programming is AusAID. AusAID implemented the Community Water Supply and Sanitation Project (CWSSP) from 2001 to 2006 to improve water supply and sanitation in three districts (Covalima, Bobonaro, and Viqueque). The CWSSP has been followed by the 10-year Rural Water Supply and Sanitation Program (RWSSP), which, in addition to supporting direct community access, supports a broad planning framework, national policy development and capacity building. The RWSSP was launched in 2007 and has an initial commitment of funding of AUD $28 million. The United Nations Children’s Fund (UNICEF) also plays an active role in the WASH sector with an emphasis on supporting access to water and sanitation in schools and development of a hygiene promotion program with the MS. ADB has also provided modest environmental capacity building assistance to the MED in the areas of water resource management and environmental assessment. International non-governmental organizations (INGOs) have historically played a significant role in providing access to water supply and sanitation in Timor-Leste. The INGOs with significant investments in the water sector include WaterAid, Plan International, Triangle, Oxfam, and Caritas. Timor-Leste has a wealth of biodiversity and an abundant and diversified natural resource base, with a number of globally significant ecosystems and endemic species, including 35 restricted-range bird species, of which 23 are found nowhere else in the world. However, it is poorly studied and there is very limited baseline information. Commercially valuable timber species include Toona suren, Santalum album (sandalwood), Eucalyptus sp., Pterocarpus indicus, and Tectona grandis (teak). The UN administration designated (but did not demarcate) 115 protected areas which cover 12.6 percent of the total land area, but these areas are not effectively managed. In 2007, the Timor-Leste government created its first Protected Area: Nino Konis Santana National Park, which covers an area of 123,600 hectares (Birdlife International 2009). Slash and burn agriculture and fuel-wood extraction are the primary drivers of land degradation and deforestation with the majority of households (both rural and urban) relying on wood for fuel. It is reported that fuel-wood consumption averages more than one kilogram per person per day, which is high by developing country standards. There is no overarching legal framework for forests in Timor-Leste. A National Forestry Policy was developed by the government in 2007 and served as the basis for the development of a Draft Forest Management Decree. The decree has not yet passed. UNTAET Regulation No. 19/2000 on protected areas created 115 protected areas with prohibitions on wildlife, forest, and mineral extraction. UNTAET Regulation No. 17/2000 prohibits logging operations and the export of wood from Timor-Leste. Any acts or contracts related to natural resources that were entered into or practiced prior to 2002 and that have not been subsequently confirmed by the appropriate authorities are not recognized under the Constitution (GOTL Constitution 2002, Art. 158). Due to lack of legislation, communities have no formal right to forestland. Communities have no formal right to forestland but, customarily, origin groups have authority to forestlands which they use for communal purposes (hunting and gathering). The greatest threats to biodiversity are linked to tenure issues and include habitat destruction, fragmentation, conversion, encroachment, and expansion for agriculture (GEF/UNDP 2007). Forest degradation from fuel-wood collection and agricultural encroachment present possible areas of conflict between communities and the forestry authorities. Two factors related to land ownership drive these activities. First, generally speaking, forests are customarily regarded as an open access domain and so may be cleared for agriculture purposes or used for fuel-wood collection. Second, there are incentives to clear the land in order to secure, through customary law, exclusive use rights to the land. The Timorese agriculture ministry, Ministério da Agricultura e Pescas or MAP, is responsible for management and development of the nation’s forests. Within the MAP, the coffee and forestry office (Direcção Nacional de Café e Florestas or NDCF) has broad responsibilities for among other things, community forestry. The government is currently considering a draft forest management decree. From 2003 to 2005, the FAO assisted the Government of Timor-Leste to support the development of a new forestry sector policy to guide the development of forestry legislation. Final legislation is still pending. The International Fund for Agricultural Development (IFAD) supported a Sustainable Land Management Project between 2006 and 2008. Unlike many other Pacific Islands, the soils of Timor-Leste are not volcanic, but are composed of thin limestone and metamorphosed sea clay which is relatively unproductive, fragile, and of low fertility. The northern edge of Timor Island has a number of important mineral deposits including copper, chromite, gold, silver, and manganese. Some important copper deposits are located in southern Baucau and northern central Viqueque Districts. Limestone and marl are widespread especially in the eastern and western coastal areas and are used extensively for housing foundations. River valleys include a wide range of sand and gravel deposits which are used locally in small-scale mining industries. The most commercially attractive mineral potential of Timor-Leste is mainly copper and gold. Copper, copper-gold, and gold occurrences have been reported but most occurrences remain unevaluated and unexplored. Manufahi District in particular, is widely recognized for its gold potential. Phosphorites potential needs to be further explored although they are known to occur in Baucau District. Phosphorites may represent a resource for small-scale fertilizer plants. Limestone and dolomite is widespread and reported from all districts, marble is reported in 10 districts, and sand and gravel occur almost everywhere. Timor-Leste petroleum reserves are largely unexplored but onshore oil and gas seeps are prevalent, indicating both onshore and offshore hydrocarbon potential. Timor-Leste’s main source of income is through revenues generated by hydrocarbon extraction in agreement with the government of Australia under the 2006 Treaty on Certain Maritime Arrangements in the Timor Sea (CMATS Treaty) and 2003 International Unitisation Agreement for Greater Sunrise (IUA), which came into force on 23 February 2007. These treaties together establish the framework for the exploitation of the gas and oil resources in the offshore area known as Greater Sunrise. The Constitution of Timor-Leste provides that the resources of the soil, subsoil, and continental shelf are owned by the State and shall be used in the accordance with national interests (GOTL Constitution 2002, Art. 139). Law 1/2003 provides that mineral resources will be dealt with in separate legislation. That legislation has not yet been developed. However, a UN consultant drafted a Mines and Minerals Management Law that was submitted to the government for consideration. The objective of the law is to open up the land-based mineral resources of Timor-Leste to credible, properly regulated investigation and sustainable mining activities. Several laws have been passed that govern the management of petroleum resources. These include laws 8/2005, 9/2005 and 13/2005 which deal with petroleum taxation, the Petroleum Fund (governing the management of petroleum receipts), and petroleum activities respectively. None uncovered during the research. The Ministry of Natural Resources, Minerals, and Energy Policy is responsible for policy formulation, implementation, and monitoring through its three directorates: Oil Gas and Energy Directorate; the Administration, Legal, and Finance Directorate; and the Geology and Mineral Resources Directorate. The Norwegian government is supporting the Government of Timor-Leste to manage petroleum activities through the Oil for Development Project.